ACCESSES – By motorway to Vigo airport or numerous access points along the route. DISTANCE – 247 km, including variations. The main pathway covers 206 km And the variations GR 58.1, 58.2, 58.3 and 58.4 cover a distance of 0.9, 4.2, 20.4 and 15.5 km respectively. POINT OF DEPARTURE / ARRIVAL – Vigo, next to the Airport and the Trade Fair Centre. 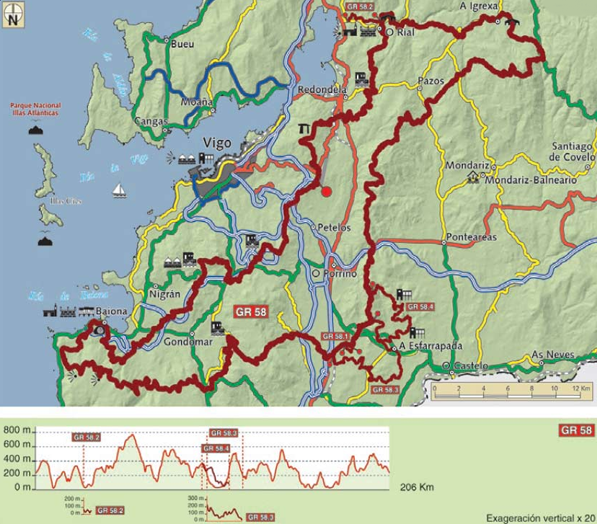 ROUTE – Through the municipalities of Vigo, Redondela, Soutomaior, Fornelos de Montes, Manors de Borbén, Mos, Pon- teareas, O Porriño, Salceda de Caselas, O Porriño, Tui, O Porriño, Gondomar, Baiona, Nigrán and Vigo. DIFFICULTY – Medium. In view of the itinerary’s distance, you have to take it in sta- ges, with good planning of accesses and sections to cover. CONNECTIONS – With PR-G 1, 2, 5, 9, 26, 67 and with GR 53 and 94. MATERIAL – If you aim to cover long sections, it is recommended to go well- equipped: good footwear, mountain boots, rucksack, protective jacket, energy foods and, although water is abundant all along the itinerary, keep your flask full. The longest of the Long-Distance pathways in Galicia runs through all the municipalities of the Joint Community of Vigo’s Inter-municipal Area. There are a large number of environmental attractions, through areas of great beauty, with no shortage of local architecture such as the Devesa mills, Barragán carballeira, fraga and banks of the Couñago, foxo de lobos (an old trap for catching wolves), the forest along the banks of the River Borbén, the River Zamáns and As Maquías mills, the Miñor marshes, the coastal cliffs of Baiona, Oliveira fraga…. Not forgetting major constructions that help to interpret the culture of these lands, such as Monte Penide’s megalithic site and the El Rei barrow, the Chandebrito Castro, Soutomaior castle or unique constructions like the mansions of Pegullal, Aballe and Picoña, in the municipality of Salceda de Caselas. 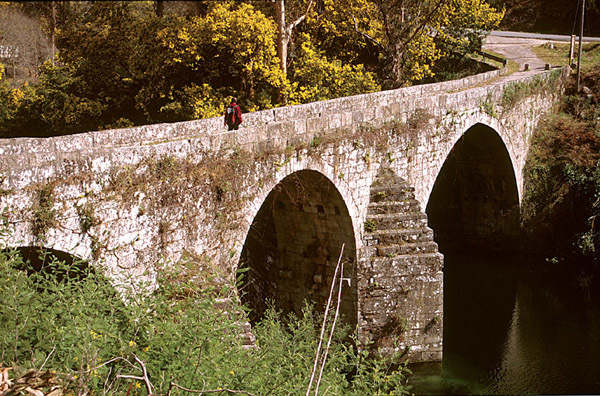 Viewpoints along this route overlook the finest sights in the south of Pontevedra province. Continuing clockwise, we come to San Simón bay, the River Oitavén canyon, the River Borbén valley, Baiona bay and the Monteferro peninsula with the Cíes islands like a backdrop, part of the new marineterrestrial Atlantic Islands National Park. The mountains make their presence felt in the Sierras of O Suído, O Galiñeiro and A Groba, like silent guardians of the road. No 185-IV Soutomaior, 186-III Ponte- Caldelas, 223-II Redondela, 223-III Vigo, 223-IV Mos, 224-I Barcia de Mera, 260-II Baredo, 261-I Baiona, 261-II O Porriño, 261-III Cristelos and 261-IV Tui.